The coaching carousel has nearly ground to a halt, so it’s a good time to take a look at the IDP ramifications of the changes to date for fantasy football. New defensive coordinators could mean new defensive schemes that positively or negatively impact IDP values. Let’s start things off by admitting up front that in today’s NFL, nickel packages are basically every team’s base defense, as every team runs them well over 50% of the time. So keep in mind that when I refer to the 3-4 or 4-3 scheme, it’s mainly done to differentiate what schemes the coach (or team) has had placed on them in the past to help figure out player designations. These designations can vary a bit depending on what site your league uses; I’m mainly riding with My Fantasy League designations. The Jets hired Adam Gase as their new coach after he was let go by divisional rival Miami, and he has brought in Gregg Williams as defensive coordinator. This hiring should create some fantasy ripples as Williams is known for running an aggressive, blitzing 4-3 defensive scheme. The positions in the best situation to benefit are edge-rushing defensive linemen and linebackers. Both Avery Williamson and Darron Lee should see an uptick in splash-play production as Williams is fond of bringing linebackers on the pass rush. As defensive coordinator and then interim head coach of the Browns, Williams brought the duo of Joe Schobert and Jamie Collins on the pass rush 261 times. By comparison, Williamson and Lee rushed the passer 194 times. Williamson and Lee combined for 2.5 sacks; Schobert and Collins had 7. On the season, Schobert and Collins tallied 15 splash plays compared to just 9.5 for Williamson and Lee. I’d like to list the edge rushers who will benefit from the Williams hire but currently that position is in a state of flux in New York. The Jets’ 2018 sack leader Henry Anderson (seven sacks) is currently a free agent. Keep an eye on which edge rushers the Jets sign in free agency and draft for potential fantasy options. The Browns stayed in house by promoting offensive coordinator Freddie Kitchens, who replaced the fired Todd Haley last season, as their new head coach. Kitchens has brought in Steve Wilks as the Browns’ defensive coordinator after Arizona let him go as head coach after just one year. Wilks was the defensive coordinator for the Carolina Panthers in 2017 and the defensive scheme was of the 4-3 variety. There isn’t any major fantasy variance here as the Browns ran the same scheme in 2018. The players we liked for fantasy purposes basically remain the same as the ones we liked heading into last season. Linebackers Schobert, Collins, and Christian Kirksey — who is returning from injury — bring LB2 potential into 2019. Myles Garrett is a top-10 draft selection among defensive linemen coming off a 13.5-sack performance last season. 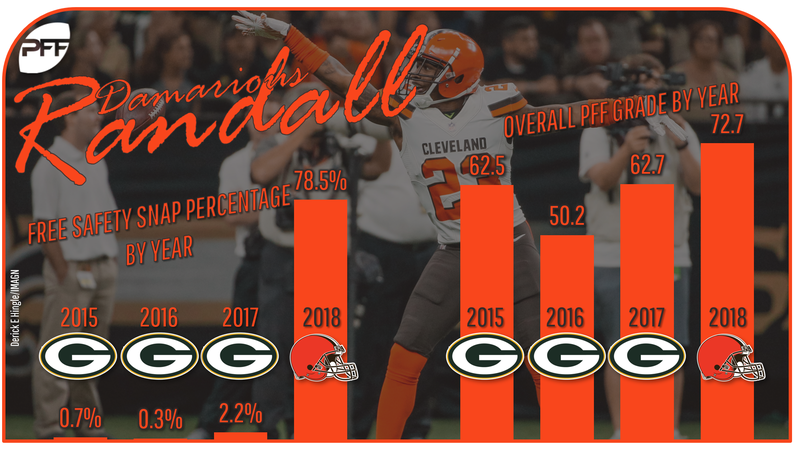 Damarious Randall flourished at free safety last season, putting up solid DB2 totals, and is worth a late-round draft selection. The Buccaneers lured Bruce Arians out of retirement to lead their team and he has hired Todd Bowles to be defensive coordinator. The two were together in the same capacity in Arizona back in 2013-2014. It’s difficult at this time to get a solid read on what type of scheme Tampa Bay will employ as both Arians and Bowles have said they will evaluate the players before settling on a scheme. For the record, the Cardinals’ defensive scheme in their time together was designated as a 3-4. It would seem to me that Jason Pierre-Paul, who led the team with 12.5 sacks last season, would benefit more from a 4-3 alignment, but we may have to wait until August (when teams generally put out their first depth chart) to get a better grasp of the scheme. If he retains a defensive line designation Pierre-Paul would be a top-10 fantasy selection. An ACL injury ended Kwon Alexander’s season after six games, and he is a free agent heading into 2019. Should Tampa Bay re-sign Alexander and he’s healthy, he would be a top-12 fantasy selection at the linebacker position. Veteran Lavonte David will once again bring solid LB2 potential into the 2019 season. The Broncos hired former Chicago Bears defensive coordinator Vic Fangio as head coach, and he is bringing his former defensive backs coach Ed Donatell as his defensive coordinator. Fangio has been linked to a 3-4 scheme for years and is likely to call the defensive plays for the Broncos this season. That basically means more of the same as Denver has been a 3-4 team for the last few years. The fantasy implications are minimal, as Von Miller and Bradley Chubb will retain outside linebacker designations that cap their fantasy value. (Sigh.) Had the Broncos switched to a 4-3 scheme, Miller and Chubb would have been fantasy studs as the numbers they amassed last season (26 combined sacks) would have landed both in the top-10 among defensive linemen in balanced scoring. 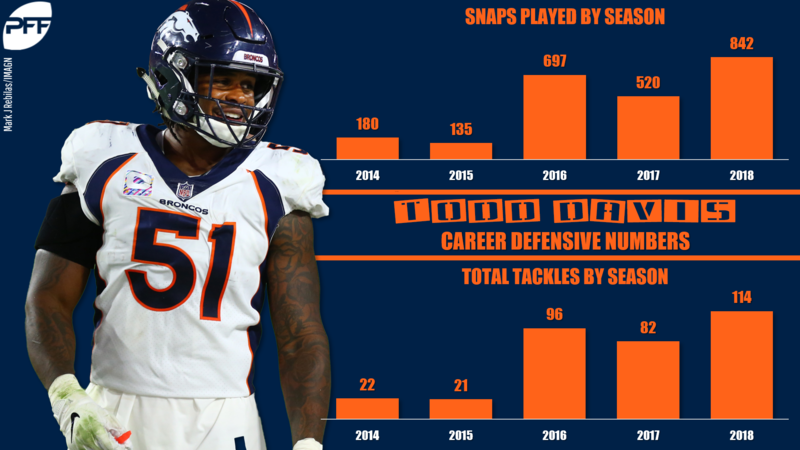 A situation to monitor is who lands the starting middle linebacker job in Denver as Todd Davis put up LB2 totals last season, reaching triple-digit tackles for the first time and playing a career-high 842 snaps. Rookie head coach Kliff Kingsbury has named Vance Joseph as defensive coordinator. That does not bode well for defensive lineman Chandler Jones. As defensive coordinator of the Miami Dolphins in 2014 and as head coach in Denver the past two seasons, Joseph’s defensive scheme has been of the 3-4 variety. That should remain the case in 2019, leading to Jones returning to an outside linebacker designation. The 48 total tackles, 13 sacks, and four splash plays Jones put up last season were DL1 numbers. Those same totals would have seen Jones land in LB4 territory in balanced scoring. It remains to be seen if a Cardinals linebacker brings any real fantasy potential as the position wasn’t fantasy relevant in 2018. The Cardinals mainly used safeties as linebackers with the trio of Antoine Bethea, Budda Baker, and Tre Boston lining up in the box or on the defensive line 1,102 times. They combined for just over 300 total tackles while Arizona linebackers were credited with just over 270. Baker and Bethea are the fantasy options to trust as of now heading into the 2019 season. The Dolphins had to wait to hire their new head coach Brian Flores until after the Patriots defeated the Rams in the Super Bowl. They had already hired Patrick Graham in late January to be their new defensive coordinator. The two worked together in New England 2009-2015. Graham spent two years as the Giants defensive line coach and was the run-game coordinator as well as linebacker coach for the Packers. The Patriots have run a hybrid 3-4, 4-3 scheme for years and Flores is likely to do the same in Miami, meaning the defensive designations are likely to remain the same as they were in 2018. Last season, the Patriots’ best IDP option was defensive lineman Trey Flowers, who managed to put up DL2 numbers. The only Dolphins defensive lineman of note is Robert Quinn, as he managed to finish last season with 5.5 sacks in the last seven games. He could be a late-round draft selection in IDP leagues. Kiko Alonso finished 2018 with LB1 numbers and is joined by Raekwon McMillan as high-end linebacker selections. Longtime fantasy standout Reshad Jones is coming off a down season and just underwent shoulder surgery. His days as a top-five defensive back selection are over. This is will be short and sweet. The Packers hired former Titans offensive coordinator Matt LaFleur as their new head coach and have retained Mike Pettine as defensive coordinator. The IDP selections are few and far between in the 3-4 scheme Pettine employs. Defensive tackle Kenny Clark is an ascending fantasy producer who put up DL2 numbers in 2018 despite missing three games due to injury and finished in the top-10 with a run-stop percentage of 9.9. Linebacker Blake Martinez remains a top-five fantasy selection heading into the 2019 season. As of this writing, new head coach Zac Taylor has yet to hire a defensive coordinator. A couple of names linked to the job are former Falcon defensive coordinator Marquand Manuel and Los Angeles Rams defensive backs coach Aubrey Pleasant. Here are a few teams that retained head coaches and switched defensive coordinators. The Chiefs have moved on from Bob Sutton and replaced him with Steve Spagnuolo. This could have big fantasy implications as Spagnuolo runs a 4-3 scheme and likes to run multiple stunts. The big beneficiary could be Dee Ford, assuming he signs a long-term deal or is franchise-tagged. Ford is coming off a career year in which he put 55 total tackles with 13.5 sacks and seven forced fumbles. He could see his designation switched to defensive end under Spagnuolo, which would pay huge fantasy dividends. The numbers Ford put up last season saw him finish with LB3/4 numbers in standard formats. If Ford had a defensive line designation those same numbers would have been good for a top-five fantasy finish. The Bears brought Chuck Pagano on board as defensive coordinator to replace Vic Fangio after he was named head coach in Denver. It will be more of the same for the Bears as they will remain in a 3-4 scheme. Unfortunately, Khalil Mack will keep an outside linebacker designation, which hamstrings his fantasy value. The Bears to covet will be linebackers Roquan Smith and Danny Trevathan. Smith finished his rookie season with LB1 totals and Trevathan brings solid LB2 potential on a yearly basis. With Brian Flores off to division rival Miami the Patriots have brought in Greg Schiano as defensive coordinator. There’s not a whole lot of fantasy ramifications here as I expect the Patriots to continue the hybrid 3-4, 4-3 scheme. As I touched on earlier the Patriots didn’t have many standout fantasy producers outside of Flowers, who is actually a free agent and might not return to the team for 2019.